Download and play extended clips of our music! Just click on the link to load and play the clip. If you like what you hear and want to buy our CDs, please click here. Thanks for listening! "I've been listening to your tapes in my car when I drive around and I'm trying to pick an appropriate piece, or section of a piece to have along with our reception photographs (for our videotape). I keep falling in love, again and again, with your music. I've become a BIG fan! And the funny thing is that no matter how many times I hear a particular piece, it's all full with so much energy and life, it's like the first time I'm hearing it! Amazing." "Through Heavy Shtetl Lox & Vodka makes a wonderful and important contribution to Jewish music. It makes it alive in a vibrant and exciting way." 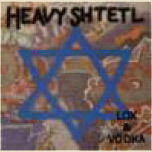 "Lox & Vodka's album Heavy Shtetl adds an exciting flaovr, both in our gallery and in the stuido where I do my painting. The music creates a shtetl mood - we enjoy it very much!" 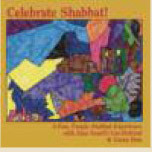 "CELEBRATE SHABBAT," a wonderful, upbeat and uplifting array of favorite Shabbat z'mirot for all ages. "Caron Dale, leader of D.C.'s excellent klezmer band Lox and Vodka, is also an early childhood educator, and this charming CD is the product of her work under that hat. Imagine Woody Guthrie's children's songs gone Jewish, and you'll have some idea what this set is like. Most of the musicians are members of Lox and Vodka, so the musicianship is on a pretty high level, but young children will be utterly unintimidated. And adults will be pleased too. Not the sort of thing I normally care for, but this is a keeper." "We bought your "Celebrate Shabbat" CD and my 2 1/2 year old son Adam LOVES it! We have to listen to it every time we're in the car (and I mean EVERY TIME since we bought it - "shabbat CD in mommy's car" he says). He just about knows all the words! (and we do too!). After most of the songs he lets out a "good song" and during the Shabbat Shalom - hey! song, he almost always substitutes a new word for 'hey' (it could be firetruck, boat, pretzel, museum, noo noo car - whatever!! - it's very cute)." "What smiles and joy on my children’s faces this CD has brought not only make Shabbat special, but everyday." 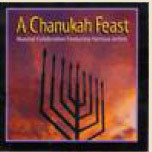 "A Chanukah Feast," musical celebration featuring various artists. Hungry for Music's* twenty-first CD release is an eclectic collection of twenty Chanukah songs entitled "A Chanukah Feast." 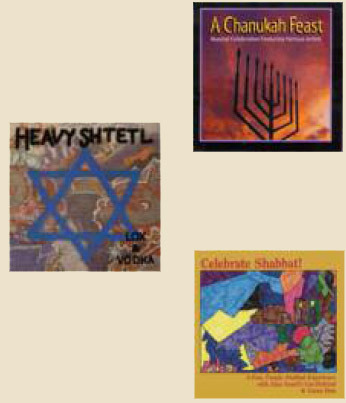 On "A Chanukah Feast" you will find everything from klezmer to honky tonk to hip hop and more. There are traditional Chanukah songs as well as original ones. Lox & Vodka is delighted to have been asked to contribute to this CD. We recorded, "These Chanukah Lights Are A Sign," with original lyrics by our own Caron Dale, put to a traditional gospel melody. "... Then Lox and Vodka, from slightly to the north in Washington, DC, do a rather excellent Jewish take on the old spiritual, "These Chanukah lights are a sign," ... Now, this is a great way to celebrate the Festival of Lights! Enjoy." *Hungry For Music's primary mission is to inspire disadvantaged children (and others) by bringing positive musical and creative experiences into their lives. Every CD you buy from HFM provides funds needed to maintain their musical instrument distribution program for inner city kids in Washington, D.C. Your purchases also support their concert programs and creativity workshops for kids. Hungry for Music is also involved in presenting concerts at Washington, D.C. area homeless shelters and retirement homes.